“The number one reason people don’t reach their goals is because they never really committed to them in the first place. Let’s begin by looking at the word commit. 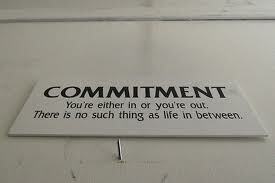 Too often people use the word “committed” rather loosely when they are referring to their goals. For example, a person will use the word committed when the reality is they are merely “interested.” The difference in the meanings between the two words is enormous. To commit means to do and to keep doing, and to keep doing, and to keep doing until completed, until you have succeeded. The larger your goal is, the longer it is going to take to reach your outcome and the greater the commitment it will require. The longer it is going to take to achieve the goal, the more time and opportunities there are for things to happen that invite you to veer off course from your goal. To succeed, you must learn to sustain your drive, and focus on your goal without distraction. Commitment is to your dreams what fuel is to an automobile. You wouldn’t expect a car to move forward without gasoline? Would you? Then how do you expect your dreams to be realized without your absolute commitment? You cannot be ambiguous about your dreams. If you are 99% invested, you’re not truly committed. 99% is not enough. Committed is 100% and nothing less. Nothing magical ever happens without your commitment. Would you want to be in a marriage with someone who is not 100% committed? What about 99% faithful? 99% honest? How much fun do you think that would be? Greatness happens when you are truly committed to something or someone. People around you can feel it. Your burning desire is contagious. Your determination is infectious. Not only do others become inspired to help you and support you, but they also feel more inspired to go after their own dreams. The collective effect of that type of synergy can move mountains. The number one reason people don’t reach their goals is because they never really committed to them in the first place.